Our point of purchase displays will get more eyes on your product than they normally would just sitting on the shelf. If for any reason you have any questions or comments about our point of purchase displays, feel free to give us a call at 630-323-1354 or fill out the form on this page and a representative will respond shortly. Your display won’t be designed simply to draw attention to your product, but to convey your marketing and brand message. Our point of purchase displays will enhance your brand’s visibility and take control of the customer’s first impression. Counter Displays – Best for smaller products that will fit perfectly next to a cash register. Pallet Displays – Ideal for showing a variety of different product lines or for larger items that require more space. Floor Displays – Also known as “kiosks”, these are some of the most common point of purchase display found at retail locations. Powerwings – These versatile setups are designed to hang a product. They are easy to install on an end cap or next to the cash register to encourage impulse buying. Sales Kits – This type of point of purchase display is more often used as promotional mailers and each of our sales kits are customized to fit your product. 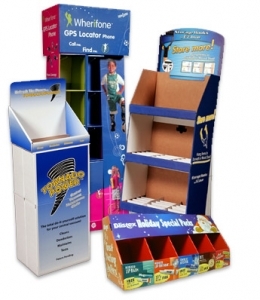 Standees – These point of purchase display are a fun and unique way to promote your product or spokesperson. They take up very little room and will guide the consumer to your product. Our point of purchase displays are very reasonably priced compared to our competitors and out team will work with you to ensure you make the most out of your custom in-store product display design. Trust us for all your packaging design needs. If for any reason you have any questions or comments about our point of purchase displays, feel free to fill out the form on this page and an associate will respond shortly or give us a call at 630-323-1354.